We have eaten and drunk our way around the world for the last 19 years, occasionally taking a break to earn a living as an editor/writer and creative director. We first caught the wine bug in 1997 while living in San Francisco. Jay proposed with a bottle of Parducci wine over a campfire in Sonoma and fashioned a ring out of the foil. Thus began our love affair with both each other and the bottle as we visited literally 150 wineries in search of the perfect venue for our wedding. (We finally settled on scenic Hanna Winery, in Sonoma’s Alexander Valley.) At the same time, we started exploring the emerging food scene of San Francisco, Sonoma, and Napa, managing to snag a table at French Laundry for our 1st anniversary meal — as of this writing, still our favorite meal ever. We started planning trips each year that revolved around our love of food and wine — to Piedmont, Tuscany, and Umbria in Italy; Rioja and Jerez in Spain; Burgundy, the Loire, and Bordeaux in France; the Douro and Porto in Portugal; Mendoza in Argentina; the Okanagan and Niagara wine regions in Canada; the Santa Barbara and Paso Robles wine regions of California; the wineries of Ohio. (Really.) There were also trips mainly for adventure and culture, but always mixed with the best culinary experiences we could find: India, Turkey, Russia, Japan, Hong Kong, Thailand, Mexico, Brazil, and others. Not all of our food and wine adventures have been so far afield; when we moved to NYC in 2001, we began making pilgrimages to restaurants in the city and nearby wine regions on Long Island, the Finger Lakes, and the Hudson Valley. Liz became the NYC Guide Writer for USAToday.com, another excuse for finding the most memorable eating and drinking venues in town. 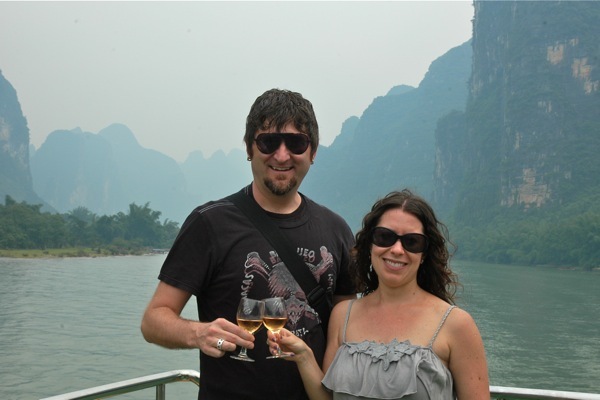 For our 10th anniversary, it seemed only natural to plan a trip to some of the most lauded restaurants (and wine regions) in Europe, and to start blogging about our experiences so that others could enjoy them. Winederlust is our record of time spent doing what we love together — experiencing food and wine around the world — and we hope that sharing the pleasures of culinary- and wine-centered travel will inspire you as much as it’s inspired us. We love to find partners who believe in travel for the soul. If you'd like to partner or advertise with us, let us know. Read our advertising policy.